The Letzshare community encourages women to interact, get together, and enjoy a number of different sports and group activities. 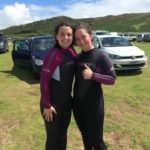 We aim to offer women the opportunity to experience a variety of sports, whilst challenging oneself, getting fit, overcome fears, building self confidence and of course having loads of fun and meeting like-minded women. I started Letzshare as I am passionate about sports and people. I have always taken part in more “alternative” sports as some people may like to define them and I am a strong believer that women can take part in all sports. I want to inspire women to do what inspires them everyday and feel comfortable doing so. FAVORITE SPORT: Snowboarding MOTTO: Don’t let anyone tell you that you can’t!